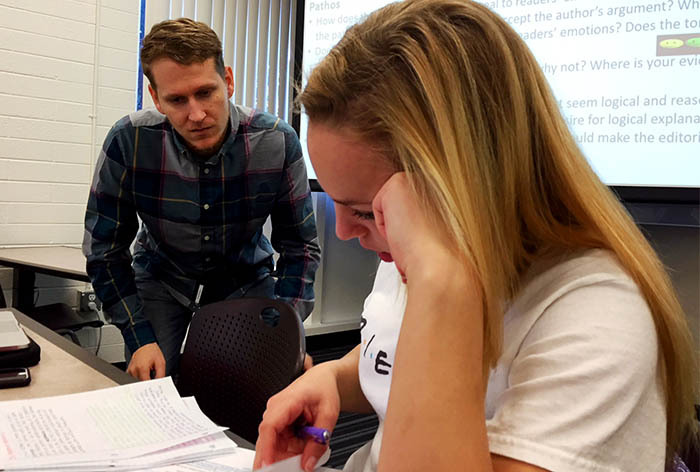 Katelyn Watson, a Grand Canyon University junior, loved her freshman-year English teacher so much that she paid an unexpected visit to her one day last semester. As it turned out, the instructional assistant (IA) who typically helps Dr. Jennifer Santos in the Developmental Writing Skills class was out that day. Education majors Timothy Sims and Katelyn Watson find enrichment through enriching fellow students in a new “Peer Mentors in Academics” pilot program. Santos, who was about to start work on topic sentences, eagerly accepted the suggestion. What followed is a touching GCU story about how Watson and sophomore Timothy Sims find enrichment through enriching others in a new “Peer Mentors in Academics” program that Santos is piloting. If there was such a thing as a triple win, this would be it. Education majors Sims and Watson gain classroom experience in their chosen field. Freshmen learn from fellow students who explain concepts in their language. Santos benefits from top-notch assistance that allows more one-on-one time in her classes. They do this for no credit, no pay and in addition to their regular course load. 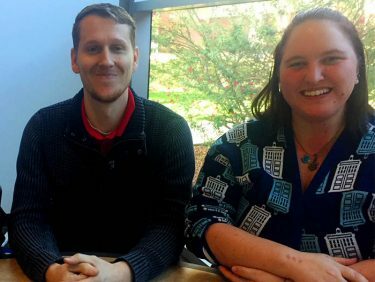 Peer mentor Timothy Sims (left) has been a big help to students in one of Dr. Jennifer Santos’ English composition classes. They are nearly as thrilled to be mentoring English composition students as the students are to receive their instruction. Sims became a peer mentor after Watson helped him with an essay about superheroes. Sims was struggling to select the perfect criteria for a superhero, one of the most important parts of the essay. Watson asked him to describe his hero’s superpowers. His hero could defend the masses, Sims said, to which Watson responded that such a definition also could include the military, commandos and police. She asked him to reflect on the DC and Marvel comics universes. That’s when Sims had his lightbulb moment. In an ENG-105 Composition I class, when students were analyzing editorials Sims responded to numerous hands in the air and helped each find pathos (emotional appeal), ethos (what gives the author credibility) and logos (logic). 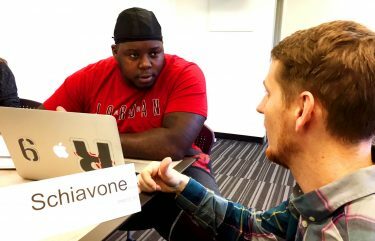 Peer mentor Timothy Sims (right) helps Schiavone Davis analyze a newspaper editorial in a recent English class. Sims’ gentle questions about an editorial on whether to pay college athletes helped Schiavone Davis determine that ethos is the least effective and logos the most effective aspect of the editorial he was analyzing. Davis also ascertained that the editorial was aimed at educators. The trust and bonding between Sims and Watson and their mentees is apparent in the appreciation students show. Hector Camacho, a student in ENG 106 Composition II, said Watson doesn’t supply direct answers but asks questions that make him think about what he wants to say. “She’s like an older sister,” Camacho said. Brianna Martinez said Watson makes English fun. “She helps me have confidence in my writing,” Martinez said. Martinez said that Watson helped her expand and solidify her argument in her definition essay. “I feel like she’s going to be a great teacher one day,” Martinez said. In one way, Watson said, the peer mentors are like IAs in that they answer questions and guide students. But they do not formally assess coursework or have access to grades. Watson and Sims are completing weekly journals about their experience, meet twice weekly with Santos about how class is going and volunteer additional ideas for mentoring duties, Santos said. For example, they would like to start holding limited office hours in the writing center.